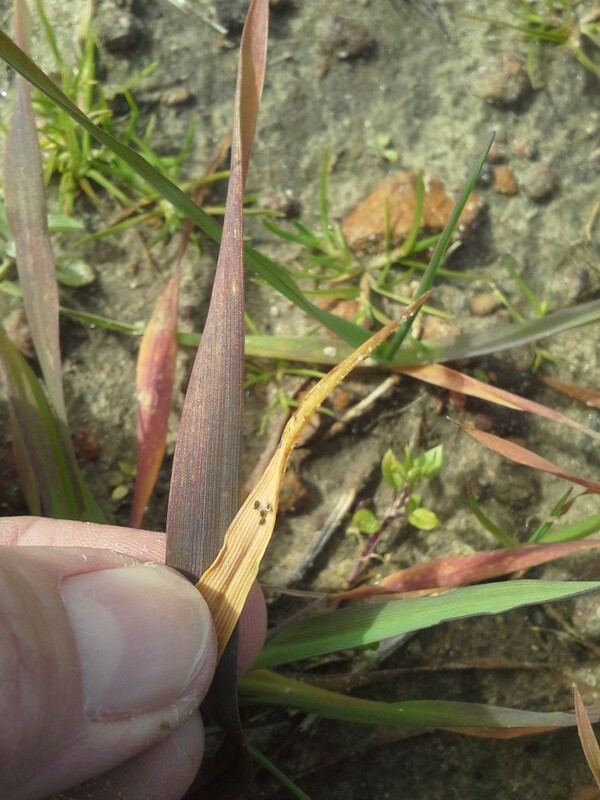 Last week I found cherry oat aphids in winter grazing. This aphid transmits a virus called Barley Yellow Dwarf Virus. You may first notice the negative effects of this insect feeding, with discoloration of oats/ryegrass. Symptoms of BYDV include discoloration that begins at tip of leaf and moves downward. This discoloration looks very similar to grass that has experienced frost damage. Of course, that has certainly not been the case with the warm temperatures that we have had. However, the unusually warm temperatures are contributing to the cherry oat aphid population. We will not see a population decrease until we have a freeze, but the aphid is capable of overwintering and causing additional damage later. To determine if your field is infected, lay back the blades of grass and look for the aphid on the underside of the grass blades. Most likely, to gain effective control you will need to spray Karate. Refer to the information below for more details and please call if you have additional questions. Among small grains, this viral disease can be the most destructive and result in serious yield and economic losses. The crop yield can be seriously impacted if the correct interactive conditions exist between; weather, aphids, virus, and host plants. 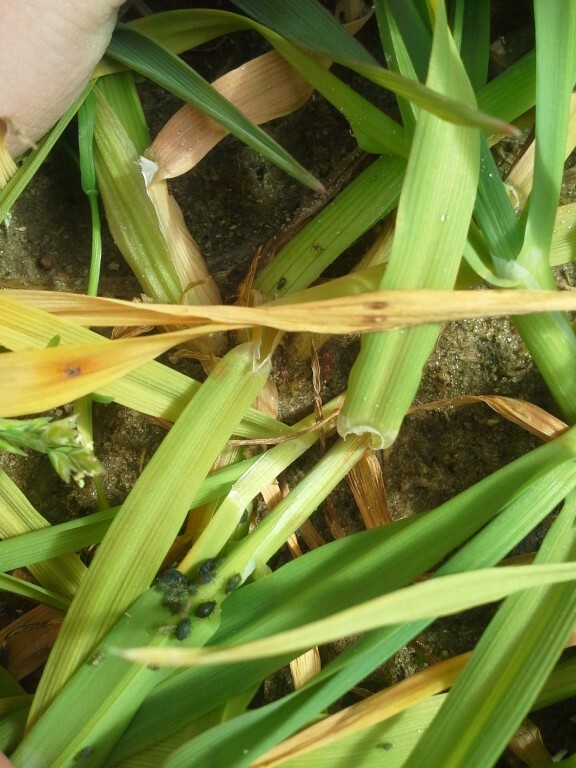 I am including recent pictures that I took in the county of observed symptoms in oats and the BYDV vector, aphids. Currently, I am waiting on lab results to confirm this diagnosis. This is due to the fact, that BYDV symptoms can easily mimic that of nutrient deficiency, cold injury, herbicide damage, etc… However, we can further affirm our suspicions, if while scouting we discover aphids, especially the Bird cherry-oat aphid. This particular species of aphid is one of the more common and important vectors of BYDV. Although, BYDV can be spread by five species of aphids, documented yield losses from BYDV have been more commonly associated with Bird cherry-oat aphid. Aphids become carriers after feeding on sap of infected plants. Once an aphid is infected with the virus, the aphid will be a continuous source of BYDV, for the remainder of it’s life cycle. The life cycle of an aphid is approximately 21 days. However, the virus cannot be transmitted to the offspring of infected aphids. The BYDV cycle would have to begin again, with the new aphids feeding on infected host plants. Epidemics of BYDV can occur when aphids carry the virus from native/wild vegetation into cultivated hosts. The pattern and direction of aphid movement determines the occurrence and spread of BYDV. The aphid is the only carrier of BYDV, it cannot be spread through other insects, seed, plant sap, mechanically, etc… At 25-35 days after planting, we should observe and scout fields for aphids and BYDV. If we experience warm temperature periods in January, the incidence of both aphids and BYDV may increase. 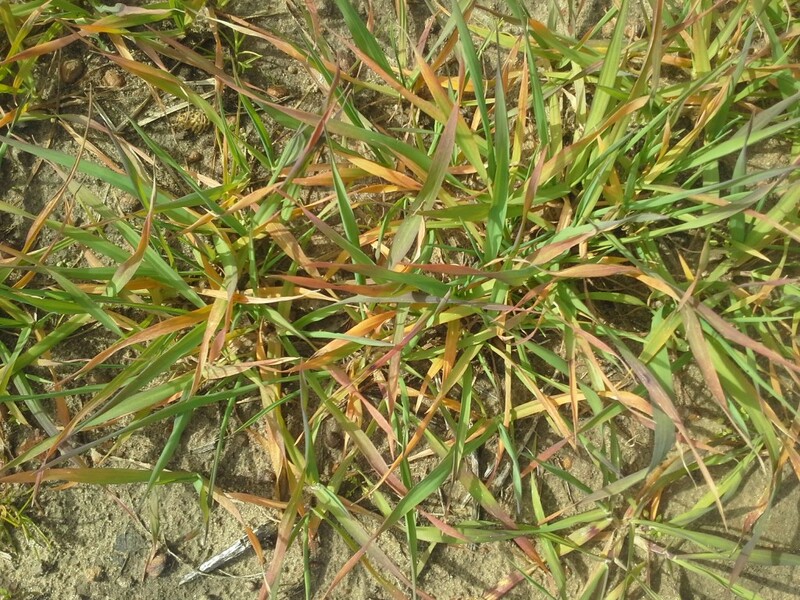 BYDV symptoms are easily visible and expressed through various shades (yellow, orange, purple) of leaf discoloration that begins at the tip and progresses downward. All small grains can be damaged from this virus (oats, rye, wheat) but oats are particularly susceptible to BYDV. 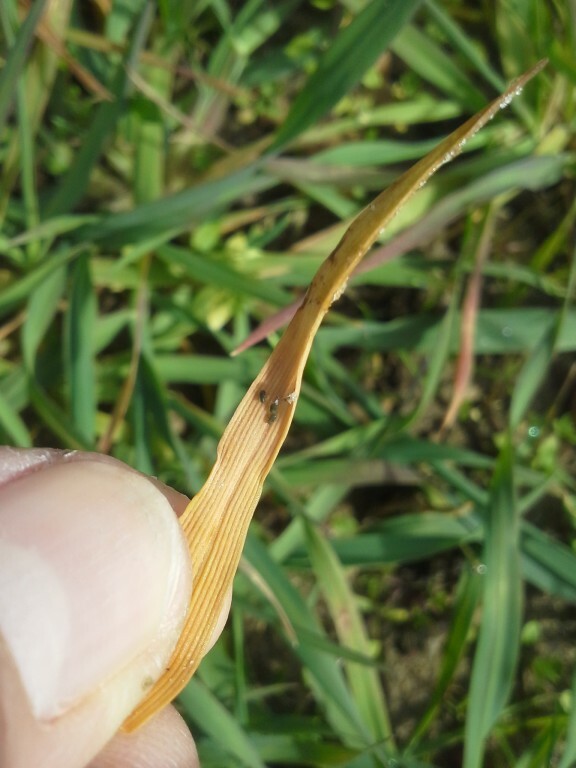 A reduction in yields is most dramatic when seedling infections occur. If a plant is infected as a seedling it may not survive or will be severely stunted. We do have a few control options to select from when combating BYDV or the potential for BYDV. 1. Delayed fall plantings of oats. However, this may not always be practical, depending upon your winter grazing plans and requirements. Also in our area, the first hard freeze can occur later and if we plant too late we can reduce potential yield. But, research has proven that later planted fields have a lower populations of aphids, which require more time to grow and spread. This scenario is temperature dependent. If cooler temperatures exist (after first freeze) we should have fewer aphids moving into fields and a decrease in reproduction and movement. Also, we can attempt to eliminate potential aphid hosts, by controlling grassy weeds that exist in and around small grain fields. 2. Utilizing seed treatments. Systemic seed treatments with imidacloprid (Gaucho, Attendant, Axcess) clothianidin (NipsIt Inside), and thiamethoxam (Cruiser) may decrease rate of BYDV infection and be effective up to 90 days after planting. The seed treatment does not kill the aphids but alters their feeding habits. However, we would be looking at a significant increase in costs of treated seed and in our locale, research has proven that seed treatments do not provide consistent returns or control. 3. Foliar insecticide applications. If aphid threshold levels are reached we can treat with; Karate Zeon, Silencer, and similar products/generics to control the aphids and decrease the incidence of BYDV. For our region, the best time to treat is at full-tiller stage (early to mid February). This insecticide treatment may be applied with top-dress nitrogen. 30-60 days after planting: 6/row ft.
Posted in Forages, Insects. Bookmark the permalink.